There are measures that you as a hot tub owner can take to ensure the longevity of your hot tub, and one is to contact a local retailer for routine hot tub servicing. Keeping your appliance serviced is vital to maintaining its optimal performance. Some issues with which you may require help from a professional involve water management (such as getting the water “just right”) and maintaining pillows, pumps, cabinets, and control panels. It is recommended that hot tub servicing be carried out once every two years by qualified specialists. Professional hot tub servicing may include flushing and draining the hot tub, cleaning it to make sure jets and ports are free from debris and are working properly, and refilling the water. You may also need filters cleaned and backwashed as well as have tests performed on various aspects of the machine. Pumps, blowers, ozonators, and entertainment equipment may need to be checked. Usually, when a hot tub is within warrantee, there is minimal or no cost to a customer for these services. The more personal routine maintenance you perform on your hot tub, the less professional servicing will be required. You should clean filters once every two to four weeks, depending on how often the hot tub is used. 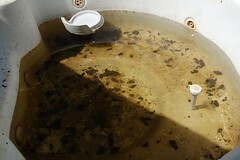 Once a tub is filled, the water should be replaced every ninety days. Hot tub manufacturers recommend that sanitizing or chlorine tablets be used at least once a week. Proper servicing of your hot tub will ensure that you can enjoy it for years to come.